Often today skirting boards are just a nondescript bit of wood fixed at the junction between floor and ceiling. This does nothing for the room and has little historical relevance. Originally a skirting board was the base of the pedestal in a classical order expressed on a wall, hence the name 'baseboard' in American English. 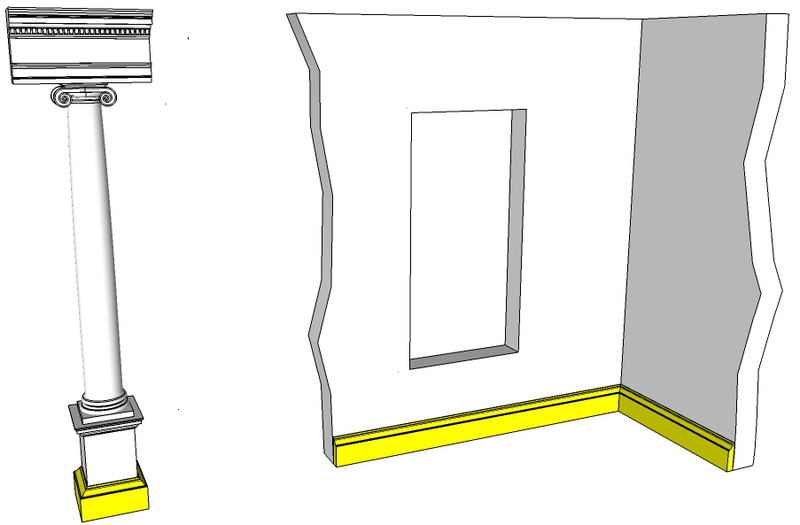 Pedestal - Base (Skirting or baseboard) in yellow. Practically, it hides the junction between floor and wall. This is important because every building subtly expands or contracts depending on the temperature and humidity, the skirting hides any gaps that may arise in the junction. Aesthetically it provides a widening at the bottom of the wall which implies strength at just the point our subconscious dictates there should be in a wall. It gives a scale to the room. The classical orders have been around for well over two thousand years and their forms are based on human proportions. A correctly sized skirting board provides a human unit of scale in a room. Once again the size of your skirting board will be determined by its size in the classical order. 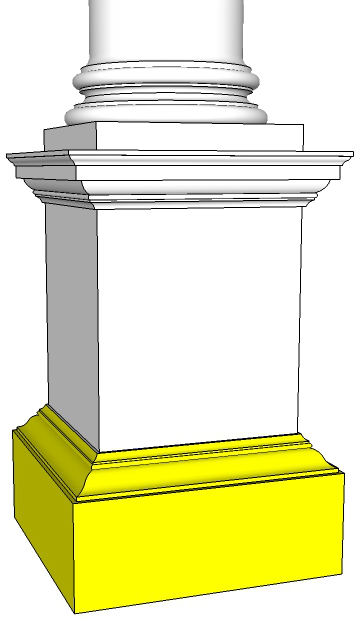 Note: The size of the base of the pedestal in the order, in relation to the whole height, is the same when applied to the wall. Andrea Palladio	– 1/17th (approx.) of the floor to ceiling height. James Gibbs – 1/15th of the floor to ceiling height. William Chambers – 1/21th (approx.) of the floor to ceiling height. So which dimension should I pick? Normally, I choose my dimensions from the two Englishmen; Gibbs and Chambers, as their architecture seems more relevant to design in the UK. Here I would recommend Palladio as 1/17th seems to work best with slightly lower rooms that are prevalent today. Andrea Palladio and William Chambers both give 1/3rd of the skirting board to the 'cap' and 2/3rds to the 'Fascia'. For Gibbs it is ¼ 'cap' ¾ 'fascia'. The important thing to consider here is that the size of the cap will determine the projection of the skirting board from the wall as the depth is always the same as the height of the cap. Again, here we must go back refer back to our classical orders. These are taken from James Gibbs' five orders. As always it's important to use the classical sources as a starting point for any new design. While Gibbs' orders are very good there are many architects who wrote treatise or instruction books that contain classical orders and consequently detailed profiles for skirting board. Searching through these gives a wide variety of starting points that are different but still effective and historically accurate. As mentioned above; generally speaking period skirting board conformed to the classical orders but the weight did vary, somewhat, according to tastes and fashions. A very simplified summary of period styles is that the early Georgians, exemplified by the Palladian movement, favoured bold skirting boards whose size closely followed the classical orders. Moldings, skirting included, gradually became more subdued as the period progressed until, in the Regency era, they were very restrained. The Victorians revived the use of full size, bold moldings but with perhaps less concern for 'classical' accuracy. 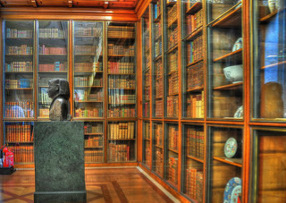 My advice, if you are trying to produce and antique look of a particular period, is to obtain a treatise published at around the time that you wish to emulate. Most of the time I would encourage you to give skirting board its proper thickness. There may be times when this is not possible or too costly. In this case the skirting board can be somewhat flattened. The important thing here is that the cap must always remain the same height as the depth of the skirting. A good way of doing this is to set back the upper part of the 'fascia' at the height that the cap would have been were it fully expressed. Maintaining the, now smaller, cap on its correct plane. Note: You may need to simplify the cap to flatten the skirting but don't simply flatten the cap! Skirting boards are nearly always made of wood. Pre-made profiles can be assembled to create the desired form or unique ones can be created with a router. For skirting that is deeper than affordable stock timber battens should be placed to give the necessary thickness. Where you go from here depends on what you wish to achieve. Almost all of the historical treatise have skirting profiles (look at the bases on the pedestal diagrams) and the importance of starting from a solid classical foundation cannot be overstated. Perhaps the best next step, if you are just learning about classical design, is Robert Chitham's book on the classical orders where he has a page devoted to drawing the various molding shapes correctly. Knowing how to draw these details accurately will allow you to approach the job of designing the larger 'whole' with more confidence and success! Above I have given a guide to how skirting should be. Learn from the past but as with all good design, make mock ups and see what you think looks right! Trust your own eyes.